Without Torah it is impossible for an individual to say that his life is full of things that cause him to offer G-d thanks; even if he enjoys mostly good times, he still cannot consider himself to be vitally alive, as most of a person’s time is occupied with food, drink and sleep, earning a living, etc. The result? “And you who cleave to the L-rd your G-d are entirely alive ,” (Devarim 4:4.) every moment of every day. Thus a person can and must thank G-d for granting him life and enabling him to reach this occasion. I periodically encounter some Jewish teachings and commentaries that apparently elevate the Jewish people at the expense of everyone else in the world. That is, it seems as if, at least in some corners of Judaism, that Jews see themselves as more spiritually elevated than Gentiles, regardless of any particular Gentile’s religious tradition, including Christianity. At first blush, this seems to smack of elitism if not downright bigotry, but we should remember that through the vast majority of Jewish history, at one time or another, most of the non-Jewish nations have tried to evict, enslave, or exterminate the Jews, in part, because of their “choseness” by God as a people. It is a fact that God did give the Torah to the Children of Israel and it has been passed down, generation by generation to their modern descendents, the Jewish people. Yes, there was a “mixed multitude” of Gentiles standing with the Israelites at Sinai who also agreed to the full conditions of the covenant, but within a few short generations, not one distinctly Gentile person remained among Israel according to the Biblical record. They had all been completely assimilated into larger Israel, and their descendants became indistinguishable from Israelites who were fully, genetically descended from Abraham, Isaac, and Jacob. So if we choose to believe that without the Torah, the full yoke of the 613 mitzvot, (or those two hundred and some that can be performed today, especially outside the Land of Israel) that life cannot be lived to the fullest, then are the Jews saying that we Gentiles do not truly live our lives full of all good things? Perhaps, at least according to the Chassidic Dimension reading I quoted above. But that’s not the end of the story, particularly for Christians. So Jesus again said to them, “Truly, truly, I say to you, I am the door of the sheep. All who came before me are thieves and robbers, but the sheep did not listen to them. I am the door. If anyone enters by me, he will be saved and will go in and out and find pasture. The thief comes only to steal and kill and destroy. I came that they may have life and have it abundantly. It appears that the Gospel of John, the most “mystic” of the Gospels, at least according to Paul Philip Levertoff, has a lot to say about the life we have in Jesus Christ. And if indeed the Master is “the Word made flesh” who lived among his people, and he thus commanded his Jewish disciples to pass on that Word and make disciples of the nations of the world, then although we do not possess the Torah as the Jews do; as the set of conditions they must fulfill as part of the Sinai covenant, we possess the essence; the life of “Torah” in our faith and our salvation. We possess life to the fullest and have it abundantly. Can we not also consider ourselves now “vitally alive” as the Jewish people do? Does that life not cause us to cry out in thanks and joy to God for all of His love, gifts, and provisions, even at those moments when we may be suffering? Yahrtzeit of Rebbe Nachman of Breslov (1772-1810), founder of the Breslov chasidic movement. Rebbe Nachman lived in Poland and the Ukraine, where he inspired thousands of Jews to greater love of God. 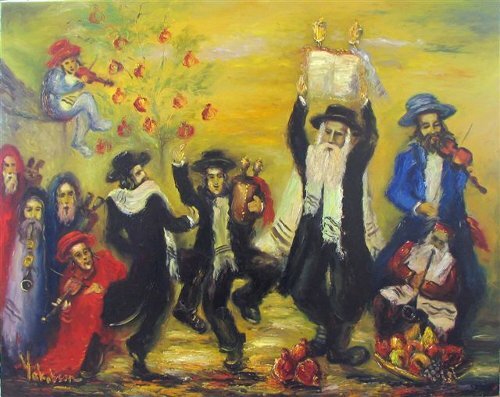 Though he suffered the loss of his son and wife, Rebbe Nachman said: “You may fall to the lowest depths, heaven forbid, but no matter how low you have fallen, it is still forbidden to give up hope.” A few of his most famous teachings are: “It’s a great mitzvah to always be happy,” and “All the world is a narrow bridge — but the main thing is not to be afraid” (now a popular Hebrew song, Kol Ha-Olam Kulo). Every year on Rosh Hashana, tens of thousands of Jews travel to Uman (Ukraine) to pray at the gravesite of Rebbe Nachman. A chassid once traveled to one of the Chabad rebbes. He related to the rebbe that his deceased teacher had appeared to him in a dream with a frightening message: it had been decreed in heaven that one of this chassid’s children would pass away that year. The rebbe heard his words, sighed, and remained silent. A reaction that certainly did not bode well. As it was shortly before the holiday of Sukkot, the chassid remained till after the holiday. When it was time for him to return home, he approached the rebbe for his blessing. The rebbe happily assured him that his family would be well. The chassid recounted how during the hakafot he was standing on the side crying when he remembered that, after all, it was Simchat Torah! He washed his face and joined the dancing, ignoring his dread. We are called not just to abundant life but to joy through our salvation in Christ. The Jewish Messiah allows us to partake in the blessings of such a completely full life that even in our tears, when we allow ourselves to be completely aware of God and His Presence among us, within pain and grief, there is still the light of joy. We are alive, and even those who have passed on to the “long sleep” remain alive in Him. 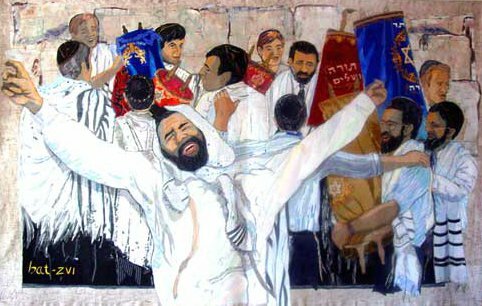 It’s difficult to communicate to most Christians the sheer happiness and celebration that is attached to Sukkot and Simchat Torah unless they’ve actually participated in those events and let themselves be immersed in such joy. And yet, even if we don’t “get” these or any of the other Jewish festivals, we should get why they are celebrating. The reason they’re celebrating is the same reason we should be celebrating. God is with us. How can we not feel completely, intensely alive? Before we came to God through Christ, we were dead in our sins, completely separated from our Creator and so numb spiritually, that we lacked the ability to even be aware of God. (see Ephesians 2:1, Colossians 2:13) Now we are not only alive, but abundantly and exceedingly alive. We have life to the fullest. We have life that extends beyond the mere beating of our hearts. We are alive in God. Good Shabbos and Chag Sameach. Previous PostAttack DogsNext PostWhat is Messianic Judaism?